Enduring ska-popsters No Doubt have regularly shaken hands with success over the past 20 years. Fronted by the high-profile Gwen Stefani (ranked at No.13 on VHI’s “100 Greatest Women In Music” list in 2012), they have assembled a truly astonishing CV that includes multiple Grammy Awards and 1995’s diamond-selling LP, Tragic Kingdom, while Tom Daly, the then mayor of their hometown of Anaheim, California, even gave them the key to the city in 2002. Having sold over 30 million albums and counting, No Doubt have enjoyed a stratospheric career and they remain a going concern; their most recent studio LP, 2012’s Push And Shove, peaked at No.3 on North America’s Billboard 200. However, they had to fight hard to gain a foothold on the career ladder and they initially lived through a decade of blood, sweat and tears before they gained promotion into rock’s premier league. No Doubt will forever be associated with their glamorous, ultra-photogenic vocalist Gwen Stefani, yet it was her keyboard-playing elder brother Eric who originally started the band during the mid-80s. Influenced primarily by bands such as Madness, The Beat and The Specials, who released music through Jerry Dammers’ influential 2-Tone imprint on the cusp of that same decade, Eric assembled a band keen to work up their own brand of bouncy, ska-inflected party music. In time-honoured tradition, the fledgling band rehearsed in the Stefanis’ parents’ garage, their initial line-up also including vocalist John Spence, bassist Chris Leal and guitarist Jerry McMahon. By 1986, Eric had also drafted in his kid sister Gwen (who, at this stage, was just 17 and still attending nearby Fullerton College) and, by 1987, bassist Tony Kanal joined after attending one of the band’s early gigs. The band barely survived an early tragedy when John Spence committed suicide a few days before No Doubt were scheduled to play a showcase gig for industry employees at Los Angeles’ renowned Roxy Theatre in December 1987. Though devastated, the band vowed to continue, with the core of their “classic” line-up eventually falling into place by 1989, after the Stefanis and Kanal recruited guitarist Tom Dumont and drummer Adrian Young. No Doubt built their reputation the old-fashioned way: gigging relentlessly in and around LA where they frequently turned in high-octane sets at venues such as The Whisky A-Go-Go, Fender’s Grand Ballroom and The Roxy, where they could often be found propping up bills for luminaries such as Fishbone and fellow SoCal ska-popsters The Untouchables. Thanks to Gwen Stefani’s increasingly alluring stage presence and the band’s energetic set of hooky, ska-flavoured punk-pop songs, record companies began to take note and, in 1990, No Doubt landed a multi-album deal with the newly created Interscope imprint. Though they’d pulled off a coup signing with the upwardly mobile and highly respected label, mainstream success initially eluded No Doubt. Their self-titled debut LP was released in 1992, but while it sold a decent 30,000 copies, it appeared at a time when grunge was still in vogue and the industry was reeling from the shockwaves emanating from Seattle. 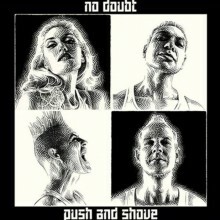 No Doubt’s bright, horn-laden ska-pop was anathema at a time when bands such as Nirvana and Pearl Jam were shifting serious units; they doggedly toured the US in support of their self-titled debut, No Doubt struggled to attract a sizeable audience outside of their Southern Californian stomping ground. Further problems loomed when the band were paired with producer Matthew Wilder for their second LP. Wilder had a track record – he’d enjoyed a US Top 5 hit with the infectious ‘Break My Stride’ in 1984 – but Eric Stefani, especially, was unhappy about relinquishing control to an outside producer and Interscope thus sublicensed the release of the band’s second LP to the small Trauma imprint. 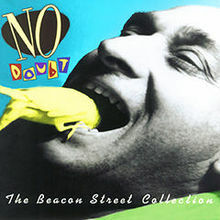 Against the tide, however, No Doubt’s second LP, the punkier and markedly more aggressive The Beacon Street Collection, performed well in the marketplace, eventually chalking up sales of around 100,000. 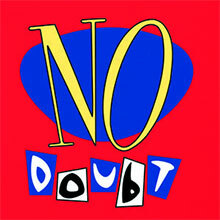 Heartened by the album’s reception, Interscope financed No Doubt’s make or break third LP, Tragic Kingdom. The creation of this pivotal record came at a price for the band, as Eric Stefani – who had been withdrawing from No Doubt since the making of The Beacon Street Collection – left the group and began working as an animator for the hit TV series The Simpsons. This blow aside, however, Tragic Kingdom catapulted No Doubt into rock’s big league. Still arguably their finest achievement, it was a wondrous collection of hooky, Blondie-esque pop spiced up by the band’s hallmark, 2-Tone-esque ska inflections, and its appeal went right across the board. With help from its infectious first single ‘Just A Girl’ (which climbed to No.23 on the US Billboard chart), the LP went supernova. The world tour surrounding the album’s release eventually stretched over two years and, after the LP’s arguable stand-out track, the classy ballad ‘Don’t Speak’, went to No.1 in America and stayed there for 16 weeks, Tragic Kingdom sold over 10 million copies in the US alone. The album eventually went on to exceed even the most optimistic record company executive’s hopes and dreams, notching up a massive 16 million sales worldwide and gaining a diamond certification in North America. A slew of industry awards followed, with the band receiving nominations for Best New Artist and Best Rock Album at the 1997 Grammy Awards, while No Doubt’s earlier catalogue also took off (their previously neglected debut LP had racked up sales of over 250,000 copies by 1999). Perhaps understandably a little dazzled by such astronomical success, No Doubt embarked on a series of protracted sessions for the follow-up to Tragic Kingdom. When their fourth album was finally released, in April 2000, it struggled to replicate the success of its illustrious predecessor. Not that Return Of Saturn was inferior by any stretch of the imagination, though it was darker in hue and also featured a clutch of down-tempo ballads. It did, however, also include a couple of striking singles in the flamenco-flecked ‘Ex-Girlfriend’ and the understated, but powerful ‘Simple Kind Of Life’, which peaked at No.38 on the US Billboard 100. Return Of Saturn also charted highly in North America, where it peaked at No.2 on the Billboard 200 and sold 1.5 million copies, earning a platinum certification. The album’s performance was perhaps modest compared with Tragic Kingdom, but it made a strong showing internationally, climbing into the Top 40 in 12 additional territories. 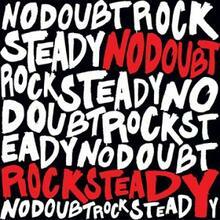 No Doubt’s profile remained high in the new millennium and they quickly bounced back with 2001’s Rock Steady: a confident, upbeat affair recorded primarily in Jamaica. Influenced by dub and Jamaican dancehall styles, the LP yielded two Grammy-winning singles, ‘Hey Baby’ (which featured Bounty Killer) and ‘Underneath It All’, which included contributions from the first lady of dancehall, Lady Saw. A star-studded affair, Rock Steady also featured input from both crack Jamaican rhythm section Sly Dunbar and Robbie Shakespeare, while the legendary Prince co-wrote, produced and performed on one of the album’s stand-out tracks, ‘Waiting Room’. Rock Steady spawned four hit singles, with both the funky, electro-enhanced ‘Hella Good’ and Thompson Twins-esque synth-pop ballad ‘Running’ following ‘Hey Baby’ and ‘Underneath It All’ into the US Billboard Hot 100. Critically, the album was well received and it won back some of the ground the band lost with Return Of Saturn, eventually selling over 3 million copies worldwide and earning No Doubt a double-platinum certification in North America and a gold disc in the UK. With the band’s star again in the ascendant, Interscope capitalised, releasing the self-explanatory The Singles 1992-2003 in November 2003. As the title suggests, it was an entertaining hit-stuffed anthology, featuring all No Doubt’s chart smashes plus one freshly recorded track, an emotive cover of Talk Talk’s 1984 hit ‘It’s My Life’. Another solid commercial success, the record again earned Gwen Stefani and co double platinum certifications in both North America and Canada. No Doubt went on an indefinite hiatus after an enthusiastically received North American tour with blink-182 in the early summer of 2004. Gwen Stefani then launched her highly successful solo career, releasing two multi-platinum-selling albums Love.Angel.Music.Baby and The Sweet Escape, which won critical plaudits galore and ensured she remained in the limelight from 2004-07. Tom Dumont, Tony Kanal and Adrian Young, meanwhile, all remained busy while No Doubt remained on ice. Dumont released a downloadable LP, The Living Album, with his alt.rock side project, Invincible Overlord; Young played with the reformed Bow Wow Wow on their 2004 tour and Kanal collaborated with Pink, co-producing and co-writing two tracks on her 2008 LP Funhouse. He also found the time to reconnect with Gwen Stefani, co-writing the stately ballad ‘4 In The Morning’ for her second solo LP, The Sweet Escape. An all-new No Doubt LP was rumoured to be in the works from 2008 on, and the band played their first North American tour in five years during 2009, bringing along special guests including Bedouin Soundclash, Katy Perry and Panic! At The Disco. Interscope then released an updated singles compilation, Icon, in 2010, before the band’s comeback LP, Push And Shove, finally landed in 2012. A highly credible comeback, Push And Shove was greeted with mixed reviews, but it remains one of the band’s most satisfying collections, its ebullient contents veering from the Jamaican patois-imbued titular song to infectious, new wave-style tunes (‘Gravity’; ‘Undercover’) and the tongue-in-cheek, synth-driven ‘Looking Hot’, wherein the 40-something Stefani ponders how much longer she can get away with sporting skin-tight clothes. Though a far cry from the diamond-selling Tragic Kingdom, Push And Shove also reacquainted the band with the upper echelons of the North American charts, peaking at No.3 on the US Billboard 200 upon its release in September 2012. Spurred on by the US Top 40 success of its trailer single, the Caribbean-flavoured ‘Settle Down’, it sold an impressive 115,000 copies during its first week of release in North America and also climbed to No.16 on the UK Top 40. Gwen Stefani recently released a critically acclaimed new solo single, ‘Used To Love You’, through Interscope, and fans are already waiting patiently for her third solo LP, which is reputedly liable to arrive in 2016. At the time of writing, this activity is likely to take precedence over a new album from No Doubt, but rapturously received contemporary shows at 2015 festivals such as Napa Valley’s Bottlerock and Chicago’s Riot Fest & Carnival have made it abundantly clear that this exuberant Californian ska-pop quartet are far from taking the chequered flag as yet. Led by the infectious, pseudo-new wave single "Just a Girl," No Doubt's major-label debut, Tragic Kingdom, straddles the line between '90s punk, third-wave ska, and pop sensibility. The record was produced by Matthew Wilder, the auteur behind "Break My Stride" -- a clever mainstream co-opting of new wave quirkiness, and, as such, an ideal pairing. Wilder kept his production lean and accessible, accentuating No Doubt's appealing mix of new wave melodicism, post-grunge rock, and West Coast sunshine. Even though the band isn't always able to fuse its edgy energy with pop melodies, the combination worked far better than anyone could have hoped. When everything does click, the record is pure fun, even if some of the album makes you wish they could sustain that energy throughout the record. 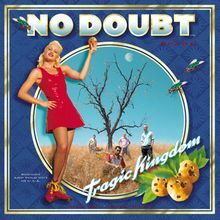 Tragic Kingdom might not have made much of an impact upon its initial release in late 1995, but throughout 1996 "Just a Girl" and "Spiderwebs" positively ruled the airwaves, both alternative and mainstream, and in 1997 No Doubt cemented their cross-generational appeal with the ballad hit "Don't Speak." Despite No Doubt's punk influences, they weren't included in the grunge boom of the early '90s. Much of the cause is due to the band's debut album, a work of polished production inspired more by '80s synth than No Doubt's heritage. Compared to Southern California's accepted ska/punk fusion, the album is quite pop-oriented, with new wave keyboards and punchy brass proving a foil to the basically ska framework and Gwen Stefani's extroverted vocals. Five years separated Tragic Kingdom and its 2000 follow-up, Return of Saturn. About 15 months separated Saturn and its sequel, Rock Steady -- a clear sign that No Doubt was getting back to business, but it's really a more accurate reflection of Gwen Stefani's stature in 2001. Once Saturn started slipping down the charts -- apparently, the kids weren't ready to hear a post-new wave album about facing your thirties with your biological clock ticking -- Stefani started popping up all over the place, appearing on Moby's remix of "South Side" and duetting with Eve on "Let Me Blow Your Mind." These were major, major hits, restoring luster to Gwen Stefani, and therefore, No Doubt, while giving them some hip-hop/dance credibility (albeit rather small cred), so it was time to turn out another record to capitalize on this re-opened window. Smartly, they followed a Madonna blueprint by working with several producers -- Nellee Hooper, Sly & Robbie, Ric Ocasek, Prince, Steely & Clevie -- and running it through Mark "Spike" Stent for mixing and additional production, thereby giving it a unified sound while covering all the bases. And they certainly cover all their bases, retaining their footing in new wave and ska revival while ratcheting up their fondness for reggae (specifically, dancehall and ragga, unfortunately; the guest toasters are the only real misstep here) and their newly acquired taste for dance and hip-hop. It's a testament to No Doubt's abilities as a band (not to mention their sheer likeability; they're just so good-hearted and unpretentious, it's hard to imagine getting angered about this band) that it neither sounds like pandering to the charts or the opening salvo in Stefani's solo career -- it simply sounds like a good, hooky, stylish mainstream pop record, something that's rather rare in 2001. Return of Saturn is an almost defiantly mature record about two things: Stefani's exploration of a troubled romance and her own romantic ideals, plus a serious attempt by the group to not only keep new wave alive, but to make that adolescent music relevant to an older audience. It's a high concept, but Return of Saturn is filled with satisfying contradictions. It's melodic, but deceptively complex; it can seem frothy, but it's never frivolous. No Doubt's desire to expand the emotional template of new wave is the perfect match for Stefani's themes -- she may be writing about love, but she's not writing adolescent love songs. Fragments of her teenaged romantic fantasies remain, but she's writing as a woman in her late 20s. She's tired of being another "ex-girlfriend" -- she wants to fall in love, get married, and have a family. It's a subject that's surprisingly uncommon in pop music, which would alone make Return of Saturn an interesting album. What makes it a successful one is that the band delivers an aural equivalent of Stefani's lyrical themes. They also begin with their adolescent musical ideals, adding depth and detail to their pop-ska foundation. They balance their non-ironic love of new wave with contemporary production and a sensibility borrowed from classic rock: that albums are greater than the sum of their parts. Surprisingly, they pull it off -- it's a far stronger record than Tragic Kingdom, even if the catchiest numbers don't have the same swagger and punch as their previous hit singles. So be it. 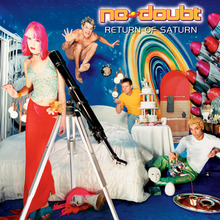 With Return of Saturn, No Doubt have made a terrific, layered record that exceeds any expectations set by Tragic Kingdom. Not only have they found their voice, they know what to do with it. Underneath it all, underneath all the glamour and stardom, No Doubt remain a group of SoCal kids enraptured by the ska revival and new wave. That's their common language, so when they reunited for 2012's Push and Shove, their first album in over ten years, they returned to this shared bond, using it as a back-to-roots template for an album that deftly weaves in contemporary sounds without ever pandering. Part of this dexterity is due to No Doubt expanding their love of ska outward toward reggae and dancehall, underlining their affection with bouncing elastic rhythms and a heavy dose of patois -- nowhere more so than on the Major Lazer-assisted single "Push and Shove" -- a self-conscious move toward musical maturity that does indeed pay off as it plays like an affirmation of roots. Similarly, the cool, glassy gloss of their pop tunes and ballads -- "Gravity," "Undercover," "Heaven" -- feel connected to their grounding in early MTV; perhaps their natural ebullience has been tempered by age, but this remains the same stylish, hooky pop that turned No Doubt into unexpected superstars in the back half of the '90s. It is also the portion of Push and Shove that sounds closest to either of Gwen Stefani's solo albums of the new millennium, bringing to mind not the thumping dance of "Hollaback Girl" but rather the breeziness of "Sweet Escape" and "Cool." And that's the interesting thing about Push and Shove, for as much as there are clever contemporary flourishes -- the most notable being a passing collaboration with dance sensation Diplo -- this is a modest, mature comeback, highlighted by the band's keen awareness of their strengths and subtle, unstated acknowledgment of encroaching middle age. Gwen tackles this subject on "Looking Hot," where she wonders how much longer she can indulge in skintight clothes, but her band has already acknowledged they're no longer the young ska-punks they once were. They've turned into savvy old pros who know when to flex their muscle and when to lay back, and that canny musicality and camouflaged maturity make Push and Shove a satisfying comeback. When No Doubt's debut album proved a disappointment to Interscope executives, the label withdrew support from the band and refused to release them from their contract. Ironically, the group's self-produced reply, recorded during several sessions from 1993 to early 1995, turned out to be finer than the debut. The synth and new wave influences of the debut are pushed to the background and replaced by a raw sound inspired more by punk.